Thanks to a tip from reader Nancy, we discovered that the company that makes Pyrex — which recently celebrated their 100th anniversary with a special collection — has released yet another vintage revival collection. Vintage Charm™ Inspired by Pyrex® — is a new brand and features sets of three decorative, nesting prep and serving bowls — each inspired by the Popular Patterns of Pyrex® Opal Glass from the 50’s and 60’s. Super cute! Above: Vintage Charm Rise ‘n Shine: Inspired by Butterprint, one of the most popular vintage Pyrex® opal patterns of all time, this set of bowls pays tribute to the heydays of the 1950’s. Above: Vintage Charm Golden Days: Inspired by the Butterfly Gold pattern of 1971. 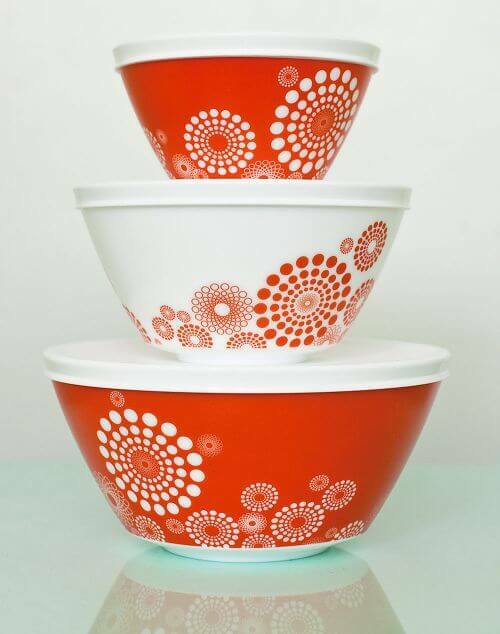 Also known as the pattern found in almost every American kitchen in the 1970’s and 1980’s. Welcome home! 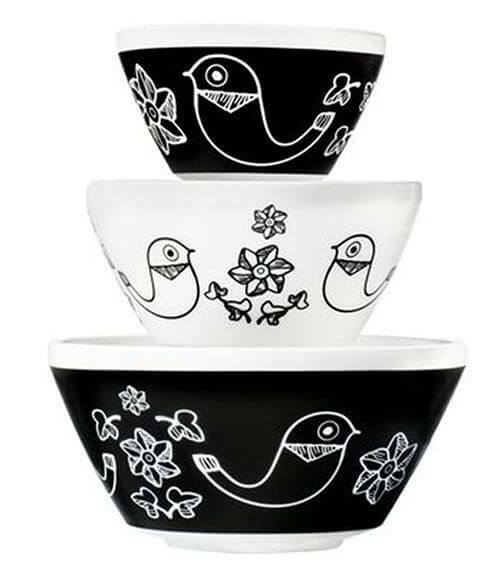 Above: Vintage Charm Birds of a Feather: Inspired by the popular Friendship pattern from 1972, grab some friends and throw a party with these Friendly Birds. 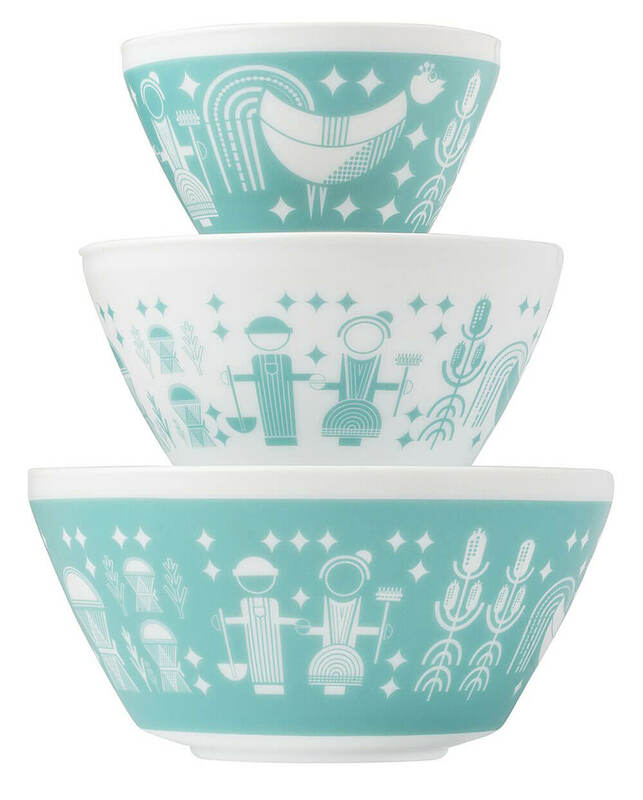 Above: Vintage Charm Memory Lane: Come back down to earth with these bowls that were inspired by the 1964 pattern, Terra. 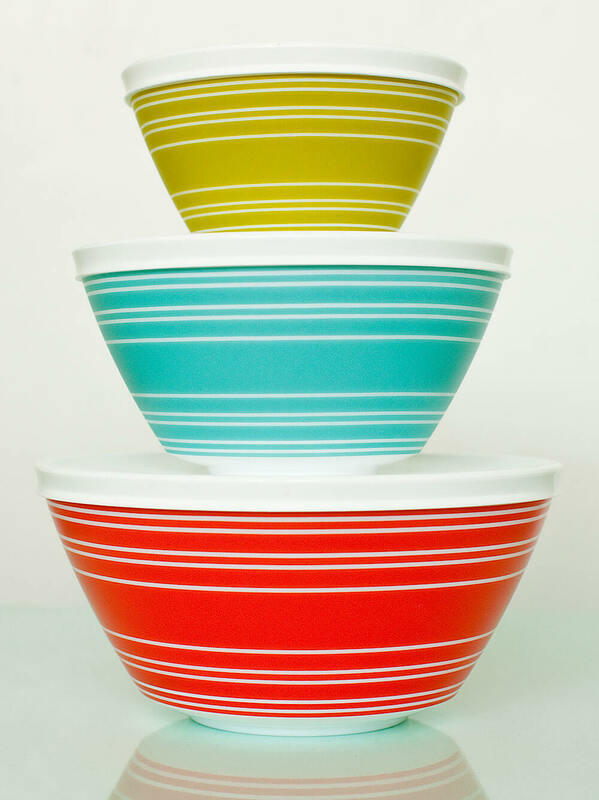 Cheerful, new colors instantly brighten up your kitchen table! Dots never, ever go out of style. Inspired by the New Dots pattern from 1967. Above: Vintage Charm Tickled Pink: Inspired by 1956’s Daisy pattern, Tickled Pink bowls are the sugar to your spice. Mix up something nice! ROSEMONT, Ill. – October 14, 2015 – World Kitchen, the company behind iconic housewares brands such as Pyrex®, Corningware®, Corelle®, Snapware®, Bakers Secret® and Chicago Cutlery®, is introducing a new line of vintage-inspired prep and serve bowls called Vintage Charm™ Inspired by Pyrex®. 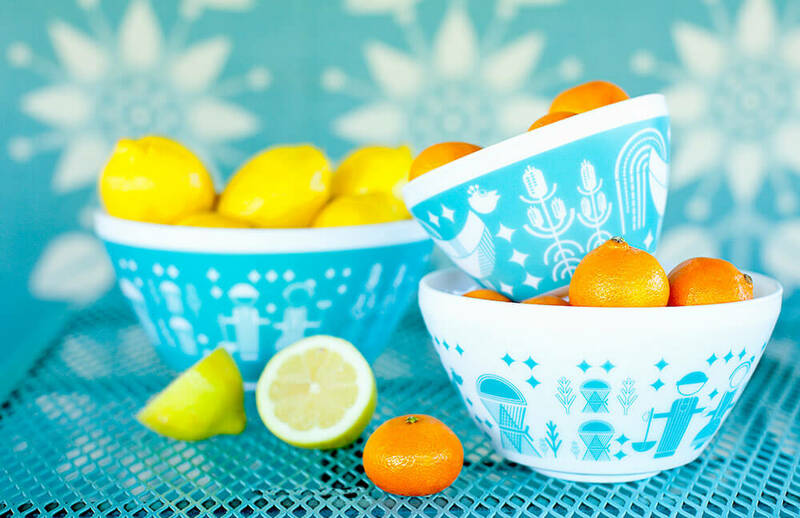 Taking a cue from the beloved designs of the classic Pyrex “opal glass” bowls from the 50’s and 60’s, the Vintage Charm brand puts a modern twist on the popular patterns that evoke feelings of nostalgia. 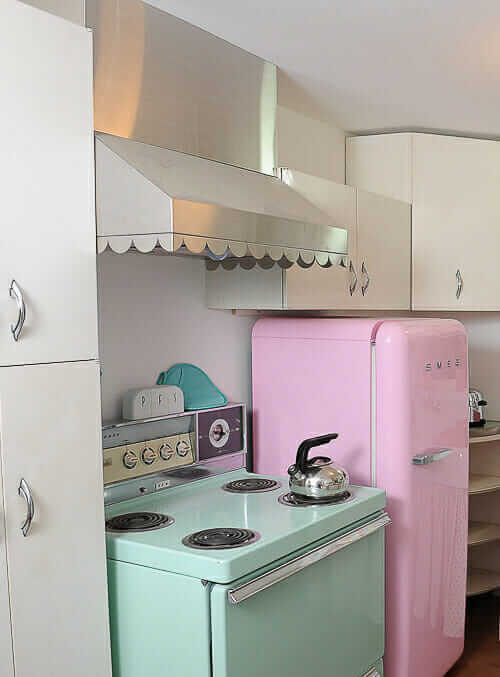 These vintage-inspired pieces come in six patterns including: Birds of a Feather, Spot On, Rise & Shine, Golden Days, Memory Lane and Tickled Pink – trendsetters can add a little flair to their home décor to achieve a retro-style entertaining experience. 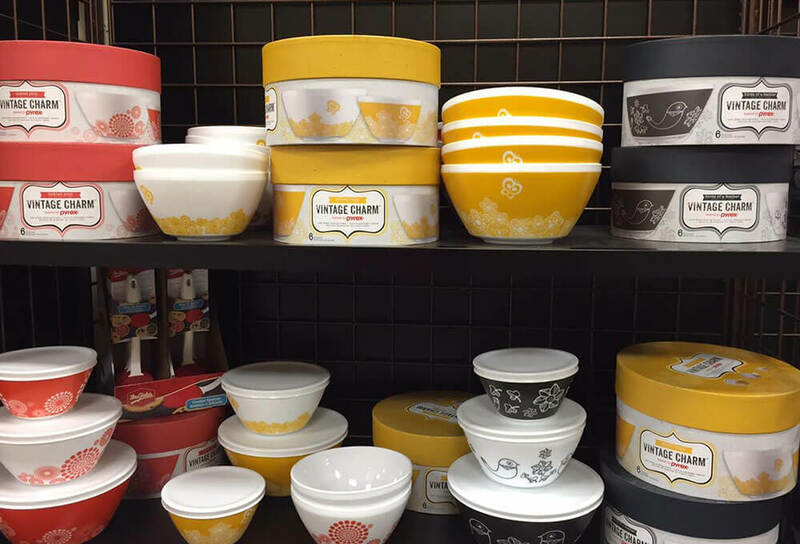 The Vintage Charm bowls are available in select housewares and grocery stores now, and will be available at mass retailers in time for the 2015 holidays. 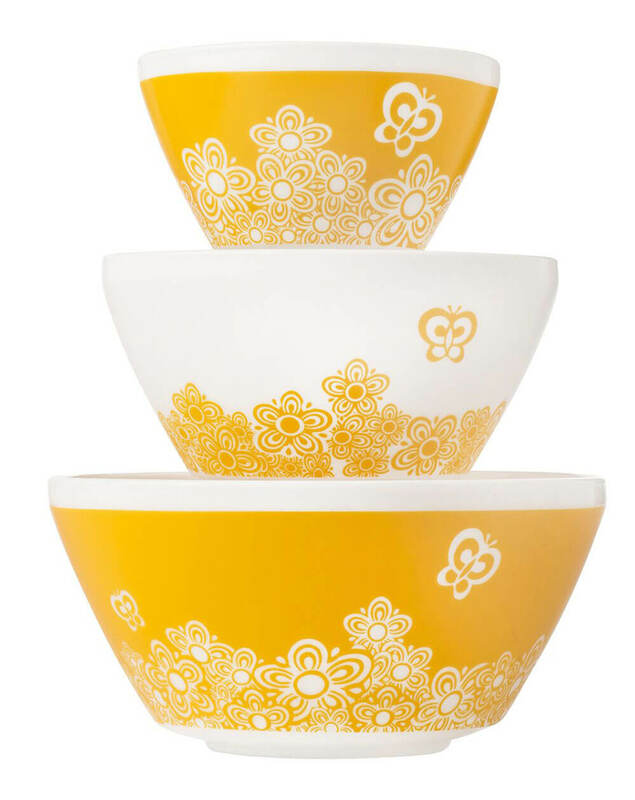 The patterns will be sold separately and as a three piece set including one small, medium and large bowl for MSRP: $29.99. The patterns will also be sold as a six piece set including one small, medium and large bowl with lids for each for MSRP: $39.99. 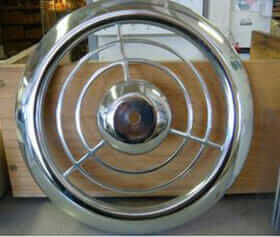 Open stock products range MSRP: $6.99-14.99. All bowls are dishwasher, freezer and microwave safe for ease and convenience while entertaining. To learn more about the Vintage Charm line and for classic retro-style design tips inspired by the patterns, check out VintageEntertaining.com. Above: Mega thanks to reader Nancy for spotting these at her local Kroger grocery store and snapping a picture for us. To purchase >> You can find these on Amazon (affiliate link) … Or, check your local houseware or grocery store (I saw “Dots” in my Stop and Shop)… or visit World Kitchen. Target has several of these styles available, and some are on sale. Check your stores or the website. So.excited for these! I asked my husband for the butterprint ones. 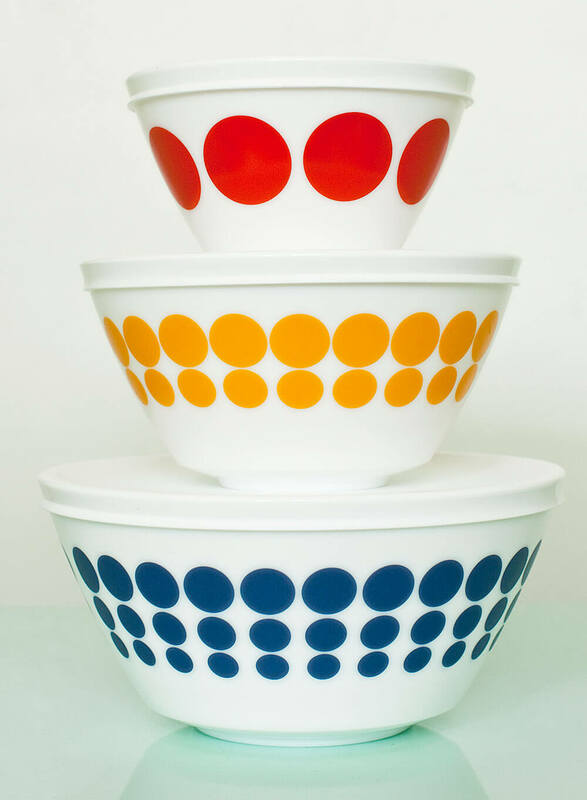 Pyrex has such neat prints. I can only find them online though. 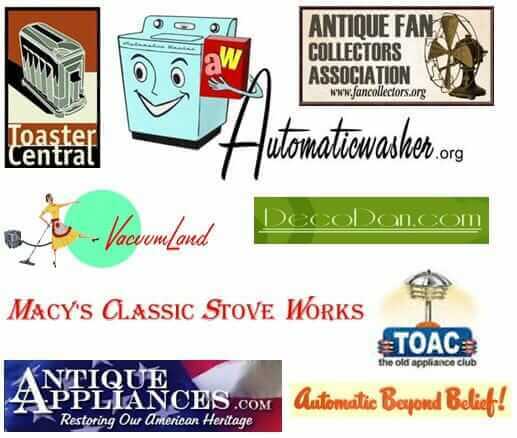 I collect vintage Pyrex, over 500 pieces. I did purchase these but will only use them for cold salad due to the quality of them. My Target store did not have the smallest bowl so am looking for them sold separately.